“Fun-Fast-Fundamentals” is more than just a slogan at Whirlwind Bridge. We know that repetitive, targeted practice is a major component of establishing a solid foundation for future growth. Our workbooks allow you to tailor your learning experience to your lifestyle. Our workbooks are based on the foundational concepts to ensure users start on solid footing. The higher level workbooks are being continuously added to the series as they are developed. Please contact us if you are interested in a concept not currently included in the series. Select topics best suited to their interest and level of play. Practice at the pace which suits their lifestyle. Whirlwind workbooks are designed with these needs in mind. Each of our workbooks focuses on a single concept and includes over 100 practice hands. These concepts are loosely grouped into three categories suitable for beginners, intermediate players and those seeking practice with advanced concepts. 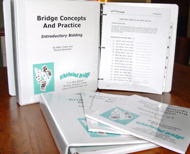 SPECIAL OFFER FOR BRIDGE TEACHERS! With the purchase of 10 or more workbooks on a topic, you will receive 12 to 16 practice hands on that topic for your classes.